At CNCNZ.com we decided to celebrate the 10 year anniversary of Command & Conquer. We originally came up with idea back in the middle of 2004. 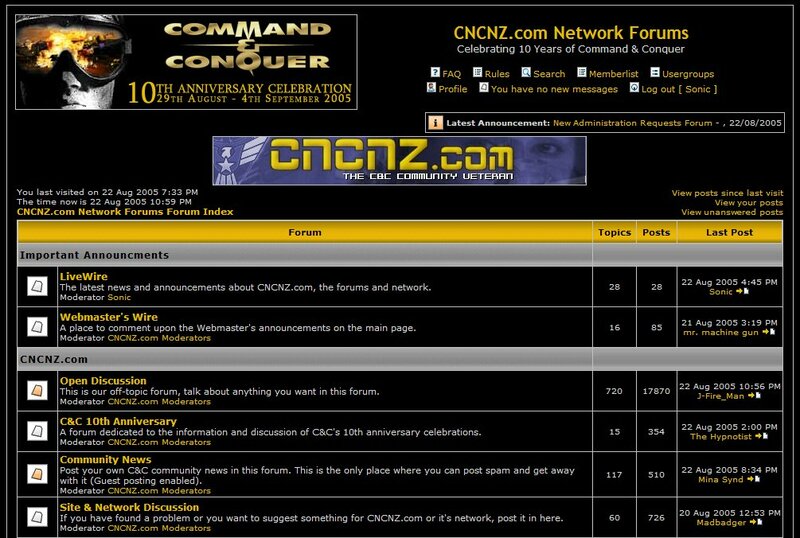 This section looks back at the events planned by CNCNZ.com, as well as what other sites in the C&C Community did as well. After all this really was a community wide event. This isn’t just any message, it’s a special audio message from an old “Commando” friend. Frank’s way of saying “I’ve got a present for Ya!” to the entire community. You can download it below. The menu below links you to all the content in the C&C 10th Anniversary section. We designed a very special theme for our forums. Its no longer available due to a change in our forum software, but you can check it out below.